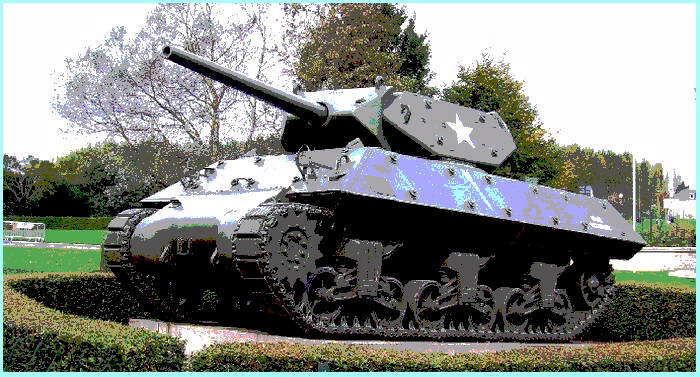 It was obvious that the gun on the M4 Sherman was not sufficient against the heavy German tanks. 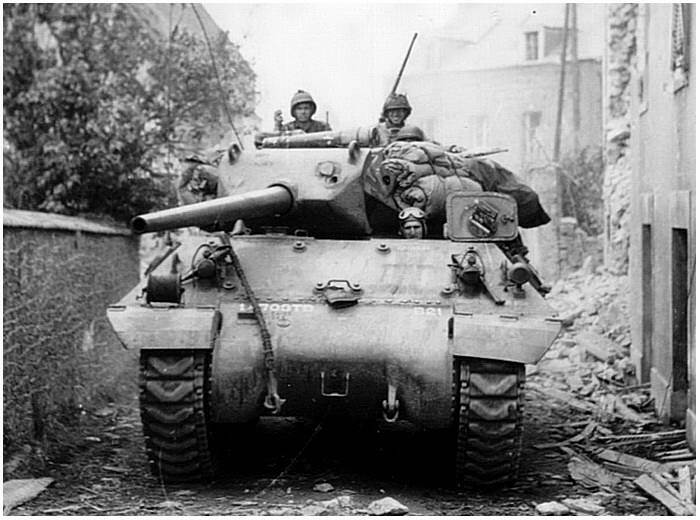 To fill this gap, a M4A2 chassis was used to built a special purpose vehicle for such a task, a 'Tank Destroyer'. The hull was flattened and the side armor was placed under an angle to bounce off the hits from enemy tanks. Because of the angular shape, the armor could be made somewhat thinner to consume on the weight. 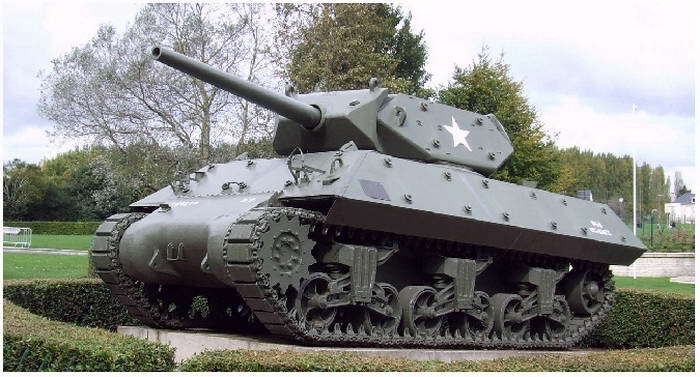 The first M10 'Tank Destroyer' rolled out of the factory halfway 1942. 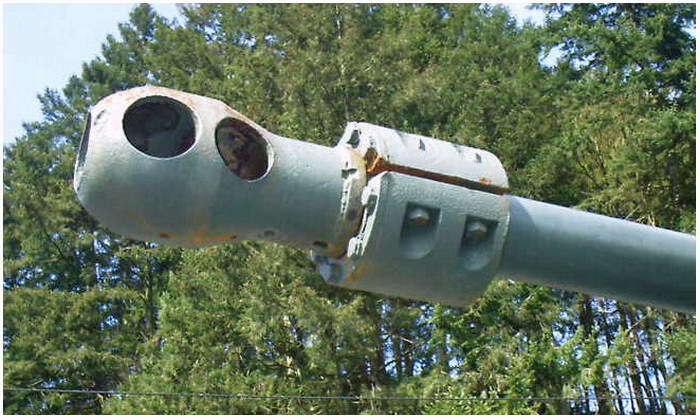 In the open turret was a 76.2mm M1A1 cannon. This was enough to destroy a Panzer IV, but the heavy German tanks stayed a tough cookie for the M10. 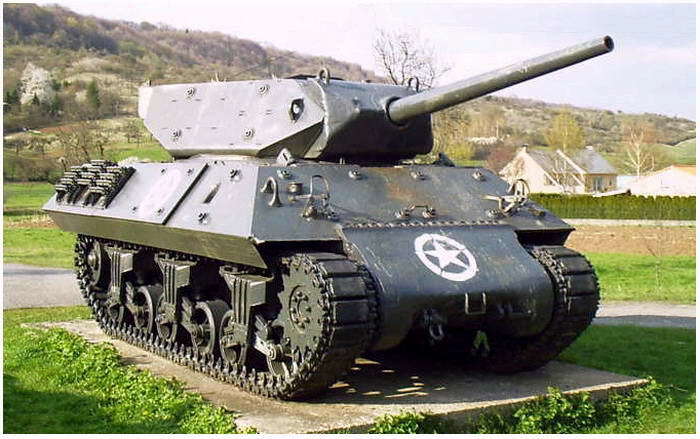 The standard shell in June 1944, the M61 APC, was not strong enough to penetrate a Tiger I in a frontal attack and the Panther could only be stopped within the 500 meters range of fire . 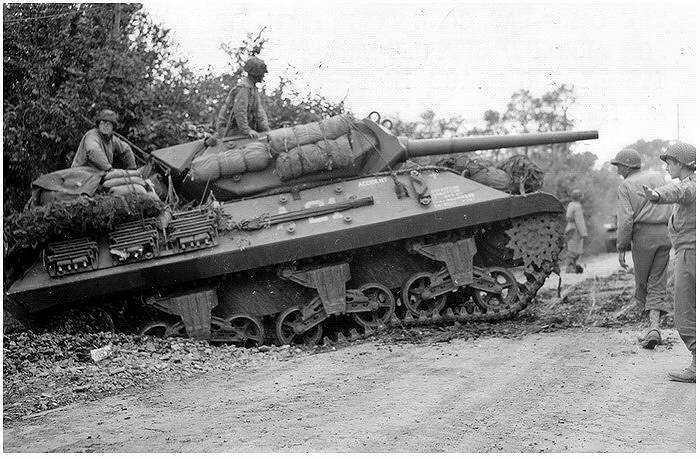 In American service, the M10 was known as the 'Wolverine' or 'Slugger'. The driver was located, just as in an M4 Sherman, on the port side, but the co-driver position was deleted. In the open turret was room for the commander, the loader and gunner. A fifth man was used to assist the loader and the gunner. Additional firepower was from a .50 Browning machinegun on the turret. The six cylinder GM 6064 diesel engine produced 410 hp and gave the M10 a maximum speed of 50 km/h. During actions the driver drove the M10 on periscope. 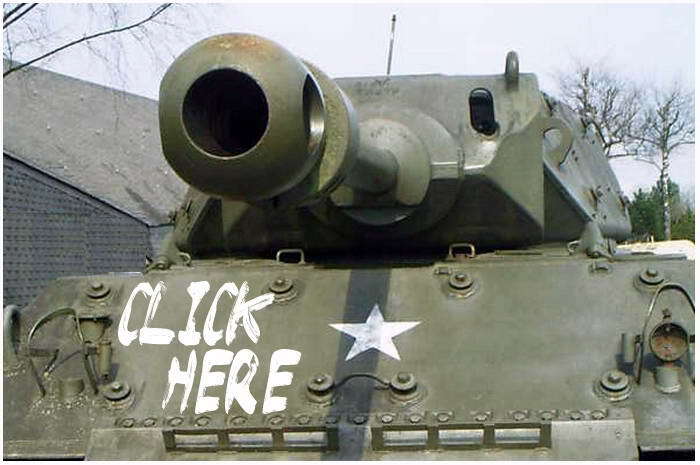 The turret and the gun turned directly over the hatch of the driver. During transfer the turret was turned at 30 degrees to starboard, so the driver could drive the M10 by sticking his head out of the hatch. 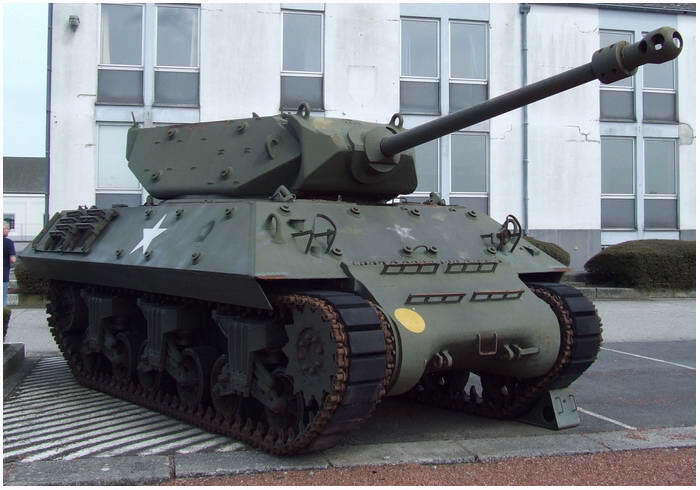 Besides a M10 built on the M4A2 chassis, there was also a version that used the M4A3 chassis. These version had a Ford GAA petrol engine and were designated as the M10A1.Between September 1942 and December 1943, Grand Blanc Arsenal built 4993 M10's. Ford produced between November 1942 and September 1943 1038 M10A1's. Besides the M10, Grand Blanc Arsenal produced from September 1943 until December 1943 also 675 M10A1's. A total of 6706 of M10 versions were produced altogether. The M10 also saw service in the British army and was known as the MkIc. In 1944 the British replaced the 76.2mm for the better 17-pounder cannon (the same gun as in the Sherman Firefly) and was christened with the name Mk IIc 'Achilles'. From a distant it is obvious to see the difference, the standard M10 had a smooth barrel, and the 17 pdr. had a muzzle brake with a counter balance below it. The muzzle brake was developed to blow of gasses so there was less revulsion of the barrel. The M10 'Achilles' in La Roche, and the muzzle brake with counter weight. There are still some M10's to find in Europe. In Normandy you can find one at the Musée Memorial de la Bataille de Normandie in Bayeux. Another M10 in France is at Fort Hackenberg, part of the Maginot Line. 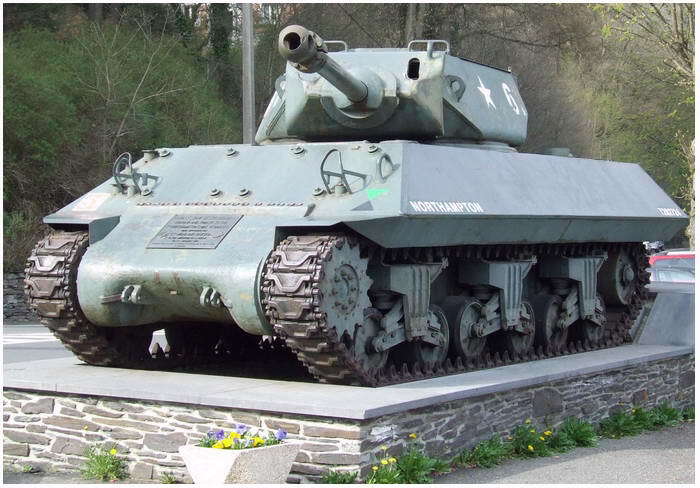 In the Belgium Ardennes are two M10's, one at the Mémorial du Mardasson near Bastonge and another one in La Roche-en-Ardenne (both are MkIIc Achilles versions).